Some data – like competitive analysis and research market opportunities - is better off in the hands of big companies. At least it may seem that way. Enter the Data Cube. BrightEdge, a content marketing platform, customers (of all sizes and in all industries) now have access to intelligence from the Data Cube, which powers BrightEdge's S3 platform. Key capabilities of Data Cube include: market research (the ability for brands of all sizes to assess how they match up with competitors and identify unforeseen content opportunities), competitive analysis (marketers can discover new keywords to target and intelligently develop long-term content campaigns), and an integrated workflow (companies get the S3 platforms’ optimization and content recommendations engine among other insights). 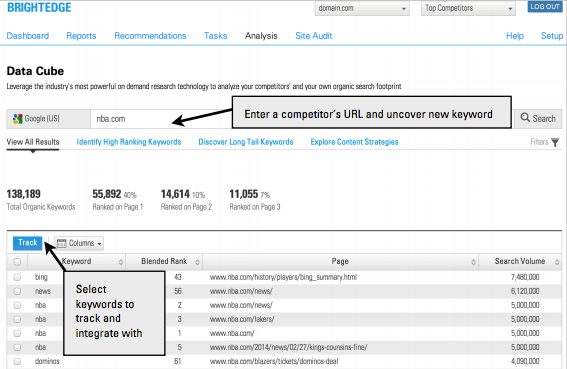 In short, marketers are able to size the opportunity, assess their competition (e.g. share of voice) and then take action based on recommendations. “Data harvesting at this scale has traditionally been reserved for the Goliaths of enterprise technology," said Jim Yu, CEO of BrightEdge. "We've developed technology that can hold its own against massive enterprises to analyze and decipher how content and rich media perform against competitors. The Data Cube allows customers to utilize one of the most comprehensive and robust data sets available to content marketers to help them better understand their market and more effectively engage with their audience."